Roll balls of blue Makin’s Clay to desired size. The number of balls will depend on the size you make, and the desired finished size for your bracelet. 7 were made for this bracelet, and they are about 1/2” in circumference. 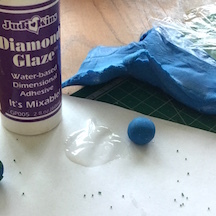 Pour a little Diamond Glaze onto a disposable surface and spread out to form a small puddle. 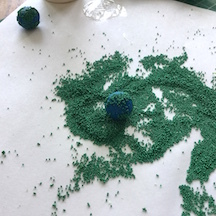 Pour green metallic microbeads onto disposable surface. 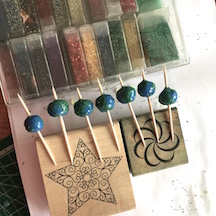 Quickly roll each bead throught he puddle a couple of times – the intention is NOT to completely coat the bead – just apply the glaze in random patterns. 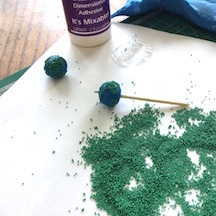 Immediately roll each bead into the microbeads. 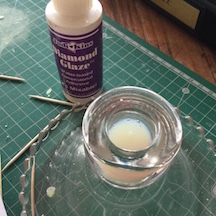 Diamond Glaze is not just a glaze, it has adhesive qualities so the microbeads will stick to the clay bead where the glaze has been applied. Make holes by carefully inserting toothpicks through the center of each bead. 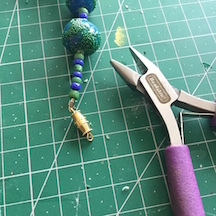 I chose to slightly flatten my beads, but you can leave them round if you prefer. 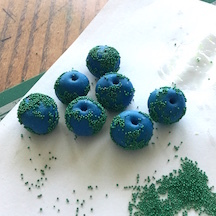 Dip each bead into the glaze to completely cover surface. 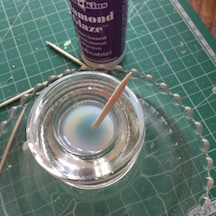 Allow excess glaze to drip back into the container, then transfer the beads on the toothpicks to dry between two raised surfaces – this will allow excess glaze to drip from the bead. 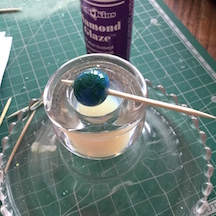 While they are drying, watch for drips/distortions and carefully remove any undesired glaze with another toothpick. Let dry 24 hours. Remove the toothpicks from the beads. 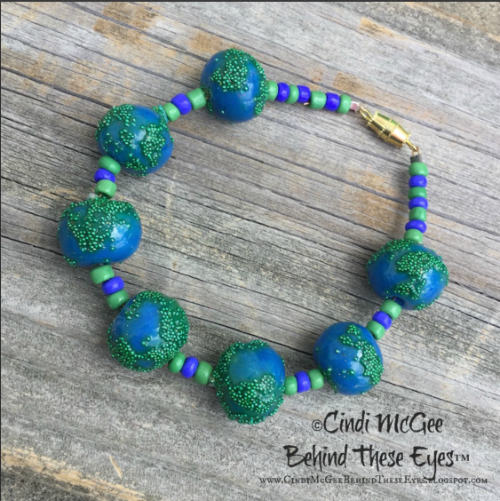 String onto jewelry wire with green and blue seed beads in desired pattern between each “Earth” bead. Add crimps and closure.